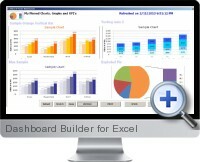 The Excel Dashboard Builder add-in (Dashboard Master) acts as a central reporting tools for pulling data from various spreadsheet sources and choosing data visualizations or tables for dashboard reporting. By binding data from multiple sources the builder solution speeds up the updating of dashboard reports for timely decision making. Any Excel object including charts, ranges and calculated analysis can be pinned from external workbooks to the dashboard report with formatting intact. Updated data from linked sources automatically flows through to the dashboards eliminating time needed to re-source the information. Dashboards can be quickly designed for user case scenarios to facilitate decision making at all levels of the organization for top management to process line personnel. Report building is simplified by breaking components into separate workbooks for KPI calculation, data tables and chart visualization which can then be combined in a single interface. A range of options for the dashboard include the ability to export via email and print as well as visualization through refresh, stretch and zoom.